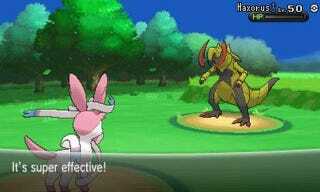 A new Pokémon X/Y online battle exploit called "Battle Analyser" is ruining online play by intercepting data. This is not good. This is not good at all. As pointed out by NeoGAF forum member UltimateIke, here's how the exploit program works: A PC is used as a wireless hotspot to intercept online data, scanning an opponent's entire party of Pocket Monsters and even showing the moves the opponent uses in battle. This exploit apparently affects all online battles (well, those against players you don't know or trust) and is the equivalent of seeing another player's hand in a round of poker. In short, it takes all the strategy out of the game's online component, giving cheaters a brutally unfair advantage. On the Bulbagarden Forums, user Clash King Dan, who called the cheat tool "unsettling" and tested it with friends, reported that "the program doesn't work with 100% accuracy yet." However, Clash King Dan added, "It is accurate enough to give you an advantage most of the time." Hopefully the game's developer, Game Freak, can do something, whether that's a patch or a signal encryption, to prevent cheaters from ruining these battles. Cheating isn't new to Pokémon's online play. Last August, a global Pokémon tournament was plagued with deceptive players. Damn shame some players need to use underhanded tricks to win. They can't be satisfying, can they?